Like most Wisconsinites, Randy Spiehs of Barron has endured a brutal winter. It was difficult for his dogs to maneuver his backyard in all the snow, so he made paths for them to walk. 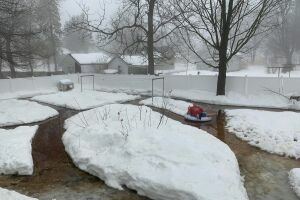 When the snow began to melt, he found an unexpected bonus: What looked like a "Northern Wisconsin Dells," complete with lazy river. "So I've been snowblowing paths for the past couple months," Randy told WTMJ television station in Milwaukee. "[Thursday] I was looking into the backyard and told my wife it looks like we have a lazy river, and I said, 'I should go blow up an innertube.'" Randy's creation has been shared on social media thousands of times, no doubt inspiring future backyard entrepreneurs.